Years of investments in warehouses and robots and data centers and gadgets — that have often tested investor patience — paid off big for Amazon over the holidays. Shoppers threw their money at the e-commerce giant, giving the company its strongest fourth-quarter sales growth in eight years and its most-profitable quarter ever. The shares rose early Feb. 2, bucking much of the rest of the tech sector and the broader markets. The results on Feb. 1 reassured investors that Amazon can spend money in areas such as advertising, entertainment and groceries while maintaining its dominance in online shopping and cloud computing. Revenue growth is accelerating even as the company is expected to cross $200 billion in sales this year and make more money from its original U.S. online retail business. Chief Financial Officer Brian Olsavsky said Amazon Web Services, the company’s profitable cloud-computing unit, and its emerging advertising business were strong contributors to sales growth and earnings. Revenue from AWS increased 45% to $5.1 billion, the Seattle-based company said in a statement. Increasing efficiency in its U.S. warehouses — where products are stowed, packed and shipped to customers — also helped, Olsavsky said. Revenue gained 38% to $60.5 billion in the fourth quarter, the biggest increase in a holiday period since a 42% jump in 2009. Net income was $1.9 billion — a record for the company — or $3.75 a share. Analysts projected earnings of $1.83 per share on sales of $59.8 billion. Amazon said its profit included a $789 million benefit as a result of the new U.S. tax law. Shares rose 5.7% in early trading feb. 2 to $1,468.50. The stock has leaped 67% in the past 12 months. 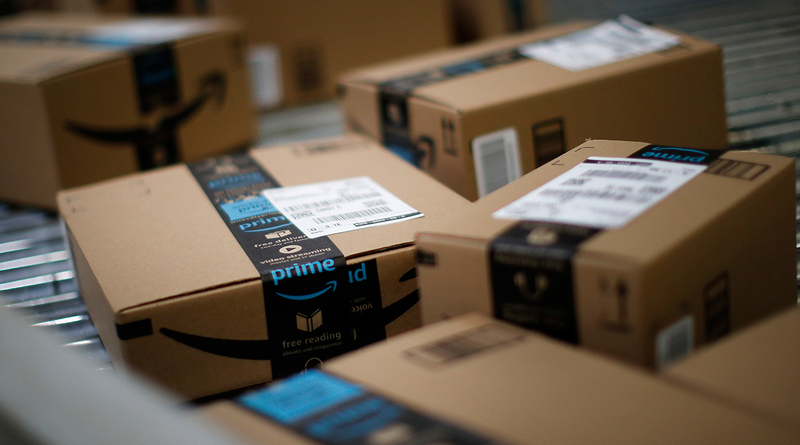 “They’re topping expectations in terms of driving new demand to the platform and becoming more profitable,” said James Cakmak, an analyst at Monness Crespi Hardt & Co.
Amazon is the e-commerce leader in the U.S. with its $99-a-year Prime subscription, which includes delivery discounts, music and video streaming. The program is intended to keep shoppers engaged with the website. The company said it will continue the global expansion of the Amazon Fresh grocery delivery service and Prime Now, a one-hour delivery service, to strengthen Prime membership overseas. Prime also helps Amazon sell services to independent merchants who want access to the website’s most loyal and biggest-spending customers. More than half of the units sold on the company’s website come from these merchants. Revenue from warehousing, packaging and other logistics services for these third-party businesses increased 41% to $10.5 billion in the holiday quarter. It has grown into a profitable business because Amazon doesn’t take on the risks associated with owning inventory, said Tom Forte, an analyst at DA Davidson & Co.
Often the question for investors is how quickly Bezos will spend his company’s money. Operating expenses in the quarter gained 37% to $58.3 billion — about the same pace as revenue growth. His latest target is tackling rising health-care costs, which he intends to do in partnership with Berkshire Hathaway Inc. and JPMorgan Chase & Co. Amazon’s voice-activated Alexa platform will also get more funding, with Bezos pledging to “double down” on finding new uses for the technology that supports the popular Echo home speakers.